Mordialloc College is a secondary Years 7–12 co-educational college located in Melbourne’s south-east. We provide quality education with high expectations and multiple pathways for students to achieve a successful career. We have a dedicated and skilled teaching team at the College and the academic progress and wellbeing of every student is of the utmost importance to us. The size of the College, and the emphasis on developing and maintaining positive relationships with students, means that each child is known as an individual. The College has refurbished Year 7 and & 8 Leaning Centres, an environmentally-friendly Discovery Centre for Science and an ICT/multimedia rich Resource Hub. A new Performing Arts Centre, canteen, PE/Sports stadium and Physiology lab were completed and ready for occupation during 2017. The College is member of the exclusive Academy of Accredited SEAL (Select Entry Accelerated Learning) Schools, which gives highly able students an even more rewarding and challenging educational experience. The Student Attitudes to School Survey places the College significantly higher than the state mean in areas including Teacher Effectiveness, Student Safety, School Connectedness and Stimulating Learning. There is a broad range of opportunities and pathways offered in the senior school, including VCE, VET and VCAL which cater for the diverse interests, needs and abilities of our student cohort. The College has 60 Equivalent Full Time staff: 3 Principal class, 58 teachers and 21 Education Support staff. The College excels at the Performing Arts, staging an annual production. Mordialloc is also strongly represented in regional sporting competitions in a wide variety of sports. Values are shared beliefs about how we work together. They influence our choices and provide a framework to guide our intentions, actions and decisions in the workplace and in the communities in which we operate. Mordialloc College staff and students share and proudly demonstrate the following four core values which we believe lay the foundation for our future success. — Work to the best of your ability. Pursue excellence, try hard and constantly seek to improve. — Be true to yourself by doing what is right. Be honest and trustworthy. — Treat everyone with equal consideration. Be accepting of others and their differences. — Be accountable for your actions. Contribute positively to the school and wider community. ‘Veho Spes Juventutis’ is the motto of our school. It translates to mean, ‘I Carry the Hopes of Youth’ and we are committed to this ideal. It underpins our approach to teaching and learning, and provides focus and purpose in the support and guidance we offer. Whether it is in our curriculum, on the sporting fields, within the music program, or as part of the drama productions, students are provided with the means to transform their dreams into reality. With the guidance and expertise of dedicated energetic teachers and the support and cooperation of parents, students can realise their potential, develop their talents and extend their skills. 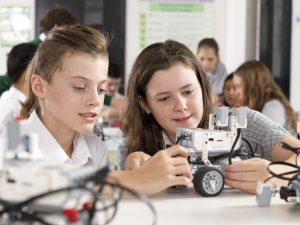 Our parents and students will confirm that Mordialloc College is a stimulating and innovative environment. Bring a positive attitude, a trust in the school and a willingness to get involved, and we guarantee an exciting and productive secondary education at our College. Mordialloc College provides a challenging learning environment where students feel safe and supported to succeed in a wide range of opportunities and pathways. Our students will become confident, successful and valuable citizens in their local and global communities. Founded in 1924 as the Mordialloc District High School with 148 students, the College was renamed later that year as Mordialloc Carrum District High school and officially opened by Cr Roy Beardsworth of the Borough of Carrum. It subsequently became known as Mordialloc Chelsea High School, with the name included above the front entrance of the 1928 main redbrick building, which is still in use at the present site and contains classrooms and administration facilities. Today, Mordialloc College has around 850 students in Year 7 to Year 12 and offers a broad range of academic and creative subjects. For a detailed history download Mordialloc College History.